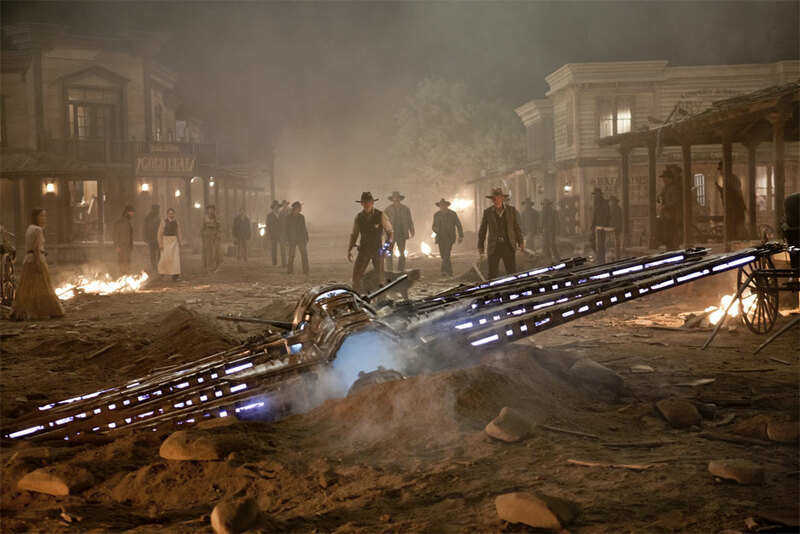 A lot of unusual things happen to the unassuming western folk of “Cowboys & Aliens.” Mainly, aliens land on earth. Yet, nobody seems to react to it. In fact, these people don’t react to anything at all. Is this a movie, or an assembly of cardboard cutouts? “Cowboys & Aliens” has a cast of cutouts that includes some of Hollywood’s best action stars being reduced of their charms and talents. Daniel Craig plays a cutout named Jake Lonergan, a wanted man who wakes up one morning with a mysterious metal band around his arm and blurry memories that might involve aliens. As he tries to piece this puzzle together, he wanders into town and captures the attention of the townspeople by standing up to the local rough-and-tumble outlaw, Percy Dolarhyde (Paul Dano), who thinks he owns everything. Among the other people in town include the timid doctor (Sam Rockwell), and the token hot lady (Olivia Wilde). After Percy’s father Woodrow (Harrison Ford) rides into town, a series of “flying machines” begin attacking and what is deemed by the priest as “demons” is most certainly an extraterrestrial attack. Now, everyone must unite and fight for the future of humanity. Where exactly did “Cowboys & Aliens” go wrong? In too many places to even keep count. With Jon Favreau at the helm, his direction feels more like it did in the second “Iron Man” as opposed to the original. That is, it feels like he started directing an action sequence and then halfway through it, gave up. As a director, Favreau hasn’t yet gotten to the stage where he can phone it in, and still pull it off. No, that takes many more years of experience. “Cowboys & Aliens” was penned by “Lost”co-creator Damon Lindelof. It contains all of the intrigue of “Lost” without an of the wonder. If you are trying to put us into a time where the idea of life outside of earth is as foreign as the idea of cell phones, you must also put the audience into that sense of wonderment. Instead, all anyone can feel the whole time is, oh they are being attacked by evil aliens from space. Where is the film’s extra hook to really surprise us; where is the film’s polar bear in the jungle? How can we expect to take an alien species seriously when their spaceship looks like Squidward’s house? The cutouts of “Cowboys & Aliens” consist mainly of a series of western archetypes. There is the young outlaw who’s seen too little, the old outlaw who’s seen too much, the knowledgeable doctor who can’t defend himself, the old coot with no teeth, and the guy who has to march down the town’s streets and yell about how he gets free drinks because he owns this town. None of the characters turn into anything above those stereotypes. I don’t blame this on the actors as much as I do on the writers. The actors do the best they can, which is really all an actor can do with weak material. Craig, who has deservedly become the new face of James Bond, seems to struggle with his American accent. It doesn’t even come close to sounding like a grisled outlaw, it sounds more like an English guy trying to sound American. Besides the Bond movies, he should just stick to playing badass Jews from now on. Harrison Ford, meanwhile, was the person I was most excited to see and yet, he doesn’t bring any of the typical Ford charm to his performance. 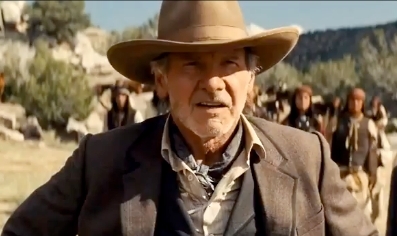 Ford has played Cowboys before, in varying forms (Han Solo; Indiana Jones), yet Woodrow carries no outlaw spirit. He seems less angry about the aliens he has to fight and more angry that he is involved in this movie. He never even seems too concerned about the missing son that he is fighting the whole movie to get back. Shocking, as Ford is usually a master at yelling about missing family members. I will say this, though: the closest the film ever comes to an actual human interaction is the scene in which Ford gives a young boy his knife. It is never very well explained, but these two characters are the only ones in the film that ever seem to have any chemistry. The fact that nothing is ever done with this represents all of the film’s underutilized potential. “Cowboys & Aliens” strives to combine two genres that have been combined many times over, with much better results. In fact, the sci-fi western has been considered a genre for decades already, ever since “Star Wars” first came out in 1977. “Cowboys & Aliens” tries to fall under this genre, but it never makes these two very different genres seamlessly blend. The point of “Star Wars” was that if it took place in the Old West, it basically could have been “The Searchers.” I don’t even know what “Cowboys & Aliens” could have been. All I know is that it really made me want to keep watching “Firefly,” the TV series that did exactly what “Cowboys & Aliens” wanted to do, but in a much more exciting and coherent fashion. The worst part of “Cowboys & Aliens” is that it isn’t very fun. I appreciate that Favreau wanted to tackle this story in a serious manner, but he takes the idea of straight-faced a step too far. Even Leone’s great western opuses had a sense of humor about themselves. As for the sci-fi part of the film, the aliens feel less like an enemy, and more like a plot device. The aliens in the film look like those from “District 9,” but with way less personality. The reason why the aliens are here at this very moment remains totally unexplained. Even though “Super 8″ somewhat failed in that respect, at least they tried to make us understand its creature. Amongst the seriousness, the makers of “Cowboys & Aliens” forgot that this is a summer blockbuster, and blockbusters can be both smart and serious while providing entertainment. This isn’t entertainment, this starring blankly at a bunch of preposterous characters and situations. Westerns are supposed to be slow, not boring. This entry was posted in Cowboys And Aliens, Damon Lindelof, Daniel Craig, Harrison Ford, Jon Favreau, Lost, Movie Review, Olivia Wilde, Sam Rockwell, Sci-Fi, Sci-Fi Western, Western on July 30, 2011 by ian0592. Ian Error! It wasn’t just written by Damon Lindleloff, there were 5 writers! Prbly too many cooks in the kitchen! Also an error in ur second to last sentence! Haha I agree with most of your comments, it definitely didn’t live up to it’s potential, but I applaud them for trying something new (genre mash-up) instead of just playing it totally safe! Also I kinda liked the mystery elements and I feel they at least attempted some heart though most of it fell flat. I also said to myself “That looks like Squidward’s house” when I saw that spaceship. Distracted me for the whole rest of the film…wondering if they did that on purpose, subconsciously, or just have a gap in their cultural literacy. I just got the blu-ray online for $4 haha though I’d dig up your review ian!